A security guard wearing a tactical vest drove recklessly on a freeway, then failed to provide his driver’s license and registration when stopped by an on-duty plainclothes sheriff’s detective in a Del Cerro neighborhood and tried to pepper-spray the detective during a struggle, a prosecutor alleged Tuesday, but a defense attorney countered that his client feared for his life because he didn’t believe the lawman was on duty. Deputy District Attorney Michael Runyon told a jury in his closing argument that 27-year-old Robert Branch had a duty to comply with Detective Paul Ward once Ward showed him his badge on May 4, 2015. 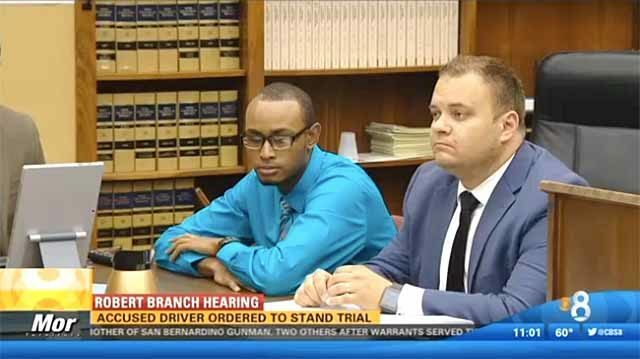 Branch — who is black — pulled out his cell phone during the traffic stop and started recording when Ward — who is white — asked for the defendant’s identification and registration, Runyon said. Branch refused to comply, telling Ward he wasn’t on duty, and was still recording when Ward told him he was being detained and applied a carotid hold to Branch’s neck, rendering the defendant unconscious for a brief time, the prosecutor said. The defendant revived and broke away from a wrist-lock, pulled out a canister of pepper spray out of his vest and aimed it at the officer, Runyon alleged. The prosecutor said Ward used reasonable and lawful force in his efforts to detain Branch. A witness who was near his family home saw the altercation and called 911 at Ward’s request, and Branch was arrested when San Diego police officers arrived at the scene. Defense attorney Marc Kohnen told the jury that Branch had his driver’s license in his hand and dropped it on the ground when Ward subdued him. Kohnen alleged that Ward lied when he told investigators that he found Branch’s license and registration in the defendant’s car. The defense attorney said Ward escalated the situation by deciding to go “all-cowboy” on Branch. He urged jurors to acquit Branch of all charges. According to Runyon, Ward’s unmarked Ford Fusion was almost hit from behind that afternoon by a gold Infiniti traveling at a high rate of speed on westbound Interstate 8. Ward saw the Infiniti weaving in and out of traffic and ultimately got behind the car and followed the driver — Branch — off the freeway and into the residential neighborhood, the prosecutor said. Jury deliberations will begin Wednesday after the prosecution’s rebuttal argument.